The inspirations and step by step instructions for many, many types of foldforming will be a boon for any budding metal smith. And well many of you knew it, judging from the comments from last week's giveaway. There are added advantages. Linnyt said,"I've done some fold forming and it's a blast. Good way to get all your anxieties out, lol." Deb Fortin added, "I just recently did some simple fold forming and man is it ever addictive." Good to know! Learning from the master metal smith himself is definitely a boon as as one reader pointed out, working by trial and error can get a tad expensive. The book is available as a hardback or in the Kindle format from Amazon . Or in other ebook formats from the publisher's site. Always useful to have it in ebook format especially if you have a tablet - easy enough to have it close by in the workshop for reference. But please be careful with that hammer if you do so! 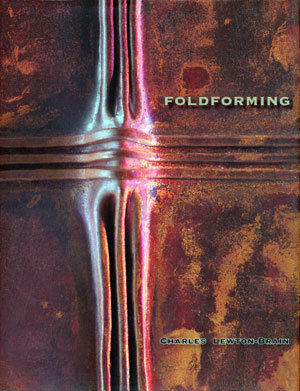 The book is also a fantastic pairing with Charles Lewton-Brain's Professional Foldforming Techniques Craftsy Class. So who won a free copy? I numbered all the eligible entries and got the random number generator over on random.org to do the picking. The winner is Marija Batraks! Congratulations!